If you happen to see the suspects, kindly help to notify the nearest police station. Alternatively, you could help by spreading the news via e-mail, your social networks, etc. 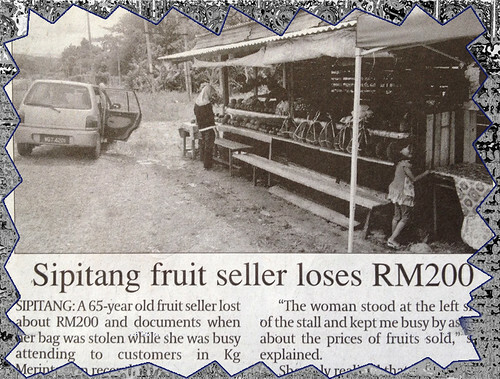 An elderly fruit seller lost about RM200 and documents when her bag was stolen while she was busy attending to customers. This happened last week in Sabah's small Southern township of Sipitang and it was reported in the Daily Express. The stall where the incident happened. According to the report, three customers (a man in his 40s, a woman, and a teenager) came to her stall located near the teachers' headquarters, in a Proton Saga. "The woman stood at the left side of the stall and kept me busy by asking about the prices of fruit sold" she explained in her police report. She only realised that her bag kept at the right end of the stall was missing when she wanted to keep money she had earned. This could happen to anyone and some unscrupulous individuals might have actively been playing such tricks along the busy roads for sometime now, especially during this time when it is Durian season. Kindly be warned and be on alert of such persons. They may or may not be the actual thieves - no one shall be considered guilty until proven - but it is always good to be cautious. I feel for my fellow farmers back home who don't earn much from selling fruits and veggies and it hurts me to think that they go home empty-handed after a full day's work. whoa.. telampau juga tu urang tu.. H ah ha..
p/s : sa punya account google kena suspend oh. damn..
ketulahan juga bah org yg mencuri ni satu hari.. These are the sort of things that infuriate me! They are many unscrupulous people out there who will do anything, even steal from poor kg folks.